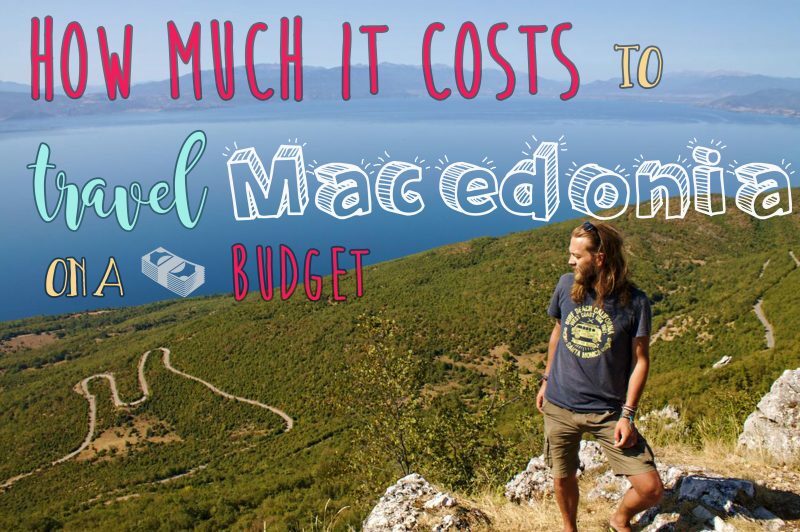 If you are planning a trip to Macedonia, it may help you to see how much it cost us. Although we didn’t write down every single expense, we did keep track of prices to give an indication of prices in different areas of the country. We arrived in Skopje at midnight from Podgorica. We arrived late at night and tried to find a room in one of the hostels. Most we asked, were already full. Some were too expensive. We got a private room for € 14, not far from the center. We realized that, as in most Balkan countries, you really need a car to get around (although Macedonia is also a popular destination for bicyclists). We rented a car the next day: 5 days for € 100. € 1 is worth 61.25 MKD (Macedonian denar) at the time of writing (September 2017). In Skopje, prices for rental cars and rooms are usually indicated in euros – both currencies are often accepted. Of course, you need denars to get around elsewhere. It’s our rule to always avoid toll roads and for that, we relied on Google Maps. No toll roads until Tetovo, according to Google, and no road signs indicating there would be a toll road. We drove along the highway and suddenly, we had to stop at a toll booth. Reluctantly, we paid (40 MKD). Then, a few kilometers further, another booth, another 40 MKD. From there, we managed to get off the highway and we decided to avoid the highways from then on. 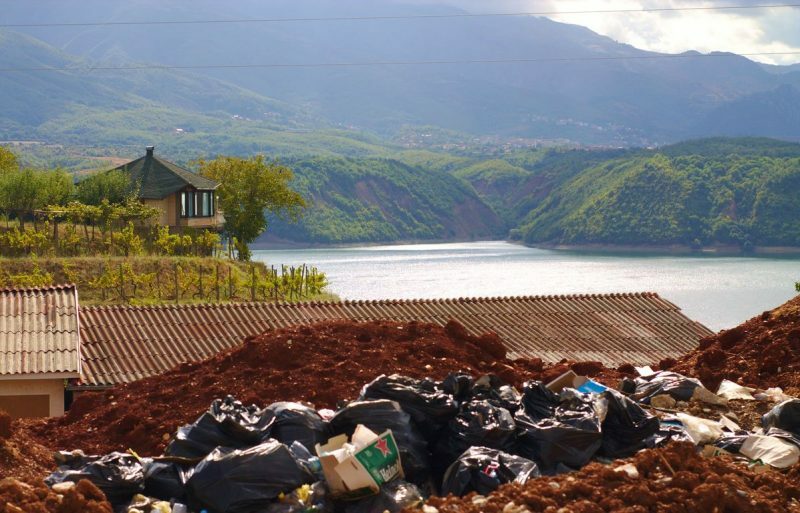 The town of Debar, just South of Mavrovo National Park and close to the Albanian border, is a small but lively place with many Albanian visitors. We grabbed a pizza before we went to sleep. There is a wide but almost empty street very close to the center where it’s allowed to park. We stayed there for the night next to a policeman who also stayed there for some hours, so we assume sleeping in your car is not illegal in Macedonia, unlike in some countries (even when parking is allowed and they don’t want you to drive sleepy). In the morning we charged our devices in a café while sipping away a coffee. Lake Ohrid is the most popular tourist destination of Macedonia. We were told it’s being overwhelmed by Dutch folks since a direct flight route has been opened from Utrecht to Ohrid. 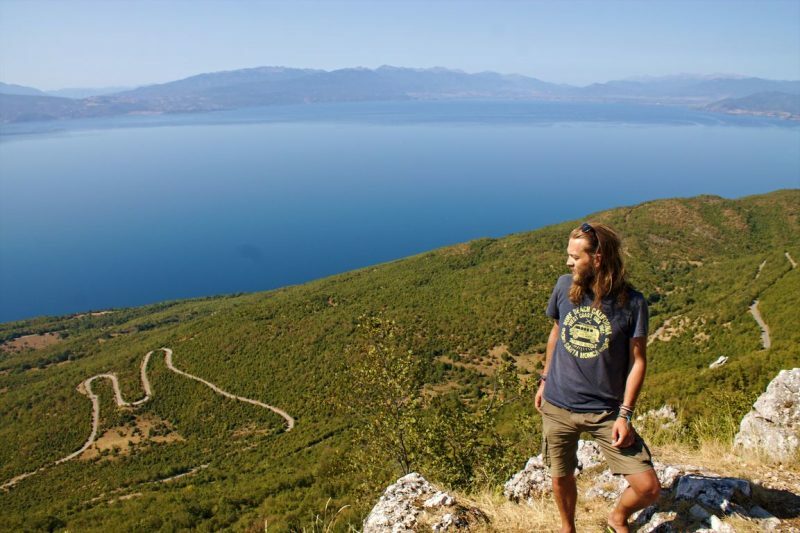 We had actually no idea what to expect from Macedonia and we never heard of Lake Ohrid before, so we wanted to find out what it was like. We got our first look at Lake Ohrid from the beach in Struga. The beach is pebbly and messy. Paddle boats, sun umbrella stands, pieces of wood and a lot of plastic trash just lies around everywhere. There are some quiet cafés and restaurants along the beach and there is free parking for those who can find a spot. The water seemed rough and cold as ice. We were the only visitors here. This was early September, which should still be high season. 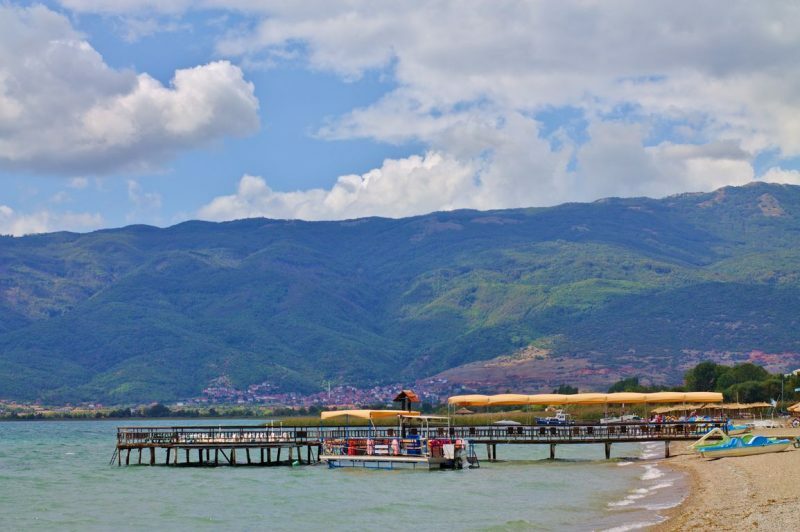 The town center of Struga is only a few minutes‘ walk from the beach. This was actually where all the tourists were walking around. White stone footpaths, wide streets full of people, stalls selling all kinds of products, big bunches of black cables hanging on poles and corners of buildings all made us feel like we were back in Bali. The atmosphere felt almost Asian. Just the food was different. We got ourselves a hamburger and fries, something we ended up eating many times while in Macedonia as it’s usually the most affordable meal. One peculiar detail: Macedonian hamburgers are filled with fries. 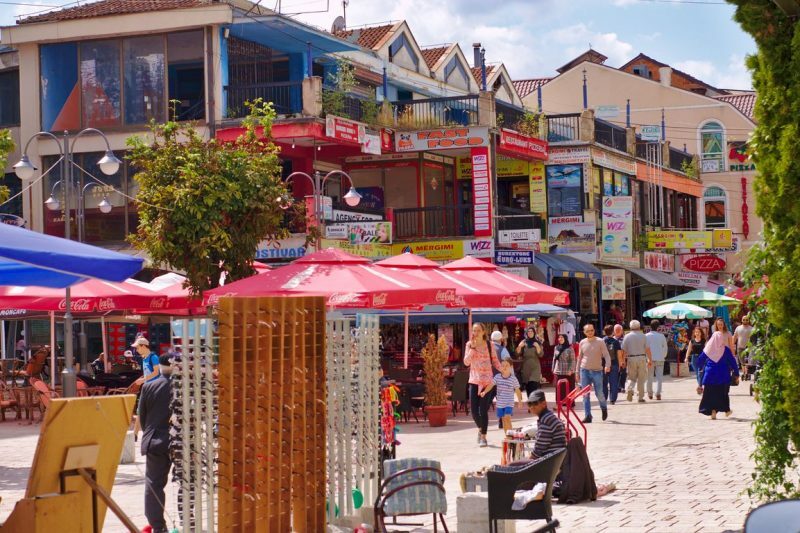 We strolled around a bit, but to be honest: Struga can easily be skipped on your trip as there is not much to do or to see. Just visit the town of Ohrid instead. 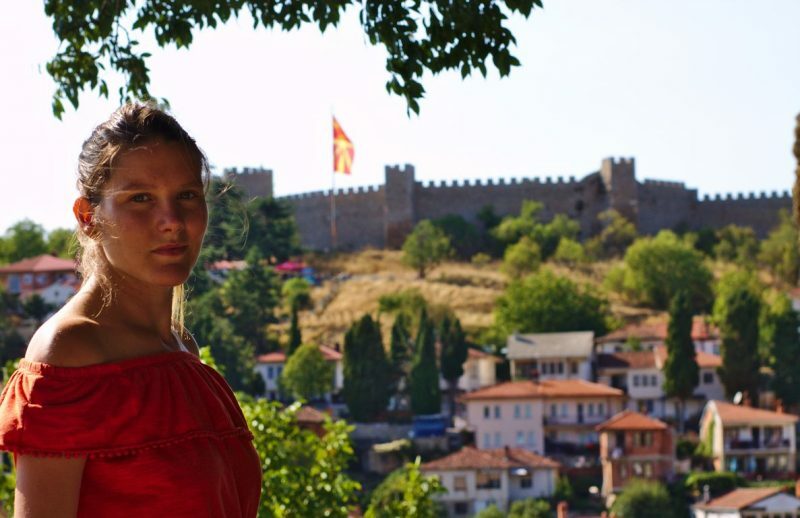 The fortress of Ohrid, or Samuel’s Fortress, can be seen over a hill along the waterside, almost like a dragon lying on top of a hill. We walked all the way up to the fortress, hoping for a good view of the town but there was an entrance fee of 100 MKD (€ 1.63) so we decided to skip it. The best way to see the fortress, is to be far away from it. We had a good view from the hill on the other side. Follow the shopping streets with overpriced restaurants to the long promenade along the coast. You can feel the breeze from the lake on a hot day or you can see the sunset with a beer. From here, it looks like you’re sitting somewhere along the ocean. There are some supermarkets nearby (Tinex and Ramstore) to get your drinks. After many days of living only on little snacks and burek, we wanted a real meal, even though prices were very high in Ohrid. We decided on a pasta restaurant in one of the side streets. Although overpriced, it was still one of the cheaper options in this area. For dessert, we got ourselves some ice cream and we got phone charger to charge our phones in the car. 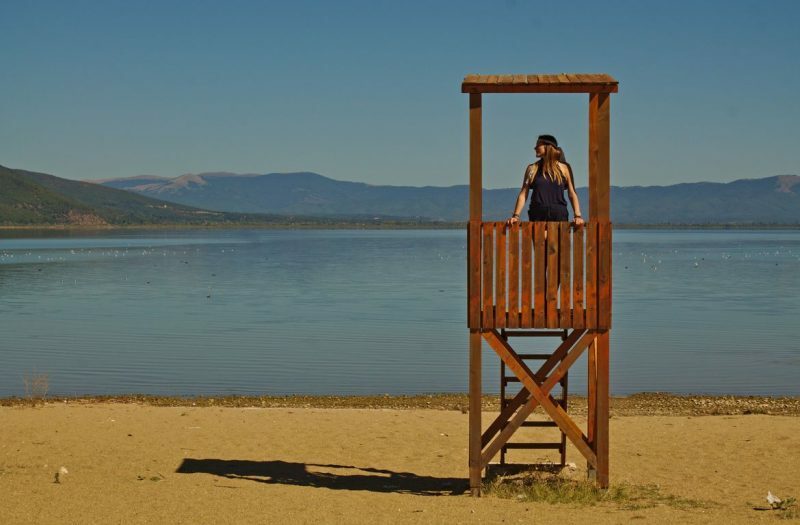 Sveti Naum offers the only real, sandy beach along the lake that we found along Lake Ohrid. The water is more shallow and therefore has a more comfortable temperature and both the sand and water were relatively clean. There is one parking lot, costing 50 MKD. It’s not allowed to park along the only street going toward Sveti Naum. We did find one alternative at the end of our walk around town. It seems possible to park on a grass field next to a church at the end of the hiking path. Near the beach, there are some stalls selling souvenirs. In the middle, there is a minimarket, but with higher prices than usual so all we bought were some old buns. 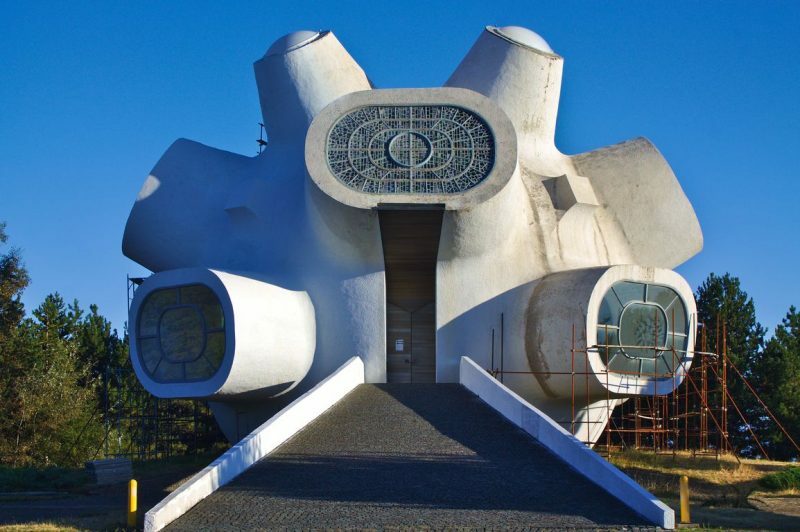 To get from Sveti Naum to Lake Prespa, the fastest way is to go through Galičica National Park. We passed the entrance early in the morning and the road was open. When we came back later to pass the Galičica route, the road was closed and we had to pay entrance to continue. Probably it would cost us more in fuel to drive all the way around, so we paid the 110 MKD and got to see some great views over Lake Ohrid on the way. The small village of Stenje is the best place to enjoy the beach. There is only one small shop that looks like someone transformed their living room into a minimarket. It look like NASA accidentally left an old hangar behind on the beach. This shiney, metal building is called Beach Bar Mystic and we spent many hours here. There were nearly no other customers and there was strong wifi signal for us to catch up on internet time that is hard to get by when traveling. Not only that, they had great food for decent prices. It was the first time in many weeks that we ate a large meal that we could afford. To find a real supermarkt, the nearest city is Resen, about half an hour drive from Stenje. There isn’t really much on the way. We passed through Bitola and spent a night in the car in a dark spot. The town center was very lively as well, what we didn’t really expect from this place. Eating here is more expensive. A hamburger with fries cost us almost double of what we paid in Ohrid. We wanted to get a pizza here, but prices of pizza were also almost double (compared to Debar), costing well over 200 MKD. There is a large parking lot by the Makedonium building in Kruševo where we could spend the night. We didn’t stay here long and only bought some food and drinks. Veles isn’t the nicest city for a traveler. We tried to find a café to charge our phones and laptops and to finally use some wifi. This seemed like a strange request in this place. We found a small restaurant that let us use their power cable – regular cafés don’t seem to have power plugs anywhere – so we got ourselves some drinks and a pizza. 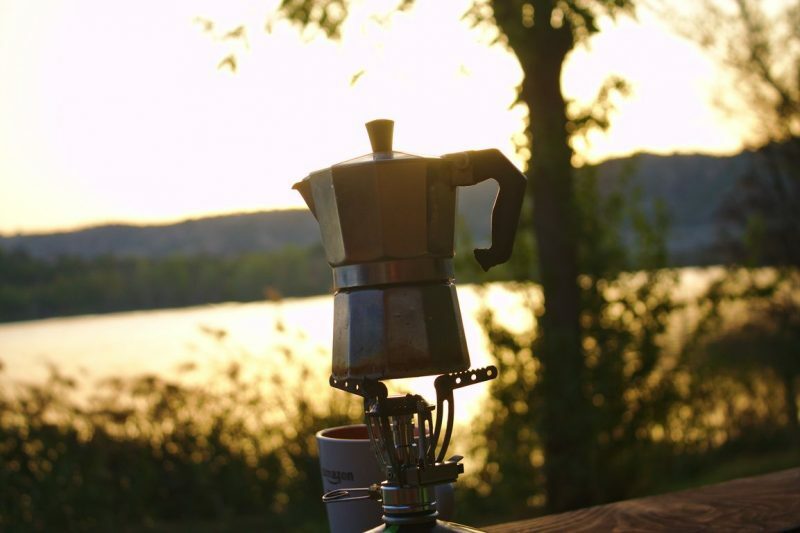 We stayed the night by the lake of Veles (Mladost Lake), where there is free parking and picknick tables to use. Our rental car had to be brought back with a full tank. Although we could sometimes drive around a whole week before refueling, our rental car from Skopje was a bit more thirsty. We refueled for the third time before returning the car. In total we spent 2680 MKD (€ 43.76) in fuel with the fuel price around 63 MKD per liter. After our return to Skopje, we spent one more night in a hostel, in a dorm room this time (€ 12). This brings our total costs for accommodation to € 26. During the rest of the week, we slept in our car. We didn’t calculate our exact spendings for food and drinks. If you travel on a budget and stay away from snackbars and restaurants, a budget of € 3 to € 5 per person is possible, but if you do like a warm snack and some beers once in a while, € 10 per day is more realistic. We estimate that we spent about € 35 per day, or € 17,50 per person, with the car being the biggest expense. A real budget traveler will surely find a cheaper way to get around. 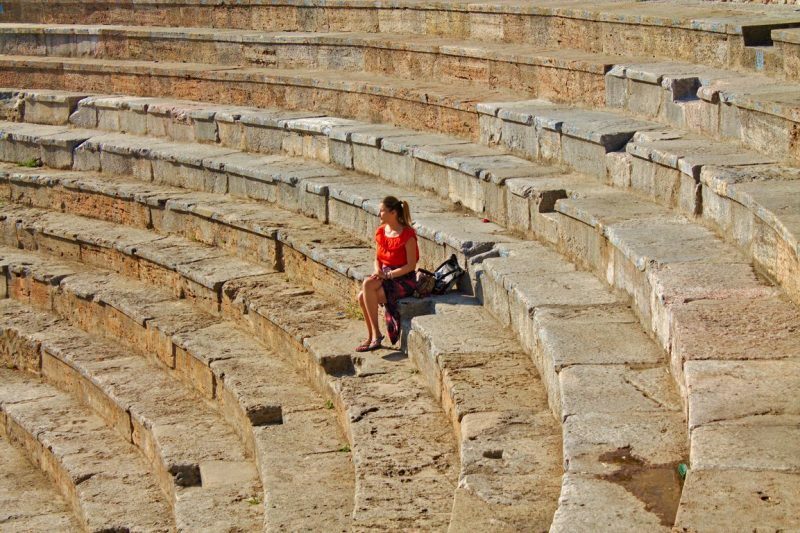 Make sure to spent time in the more beautiful places of the country and don’t stay in Bitola or Skopje too long as these are the more expensive places. 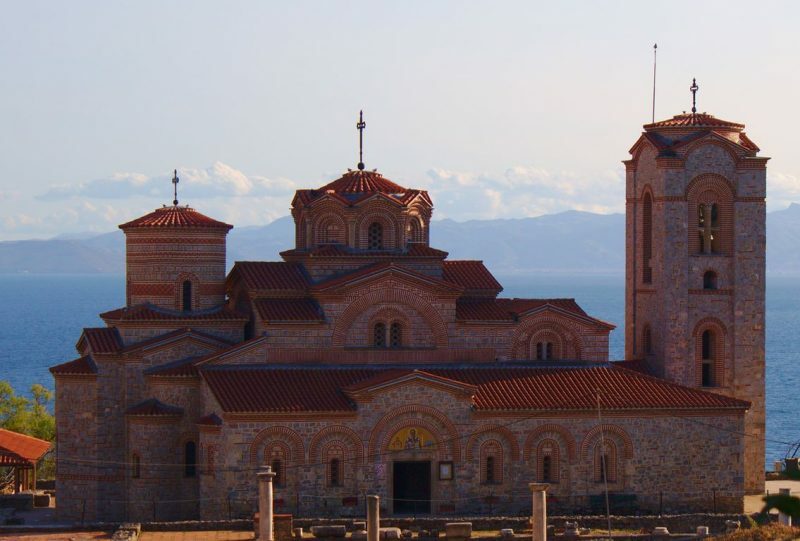 For more travel inspiration, have a look at the best viewpoints and swim spots around Ohrid but also make sure to read the peculiarities about Macedonia to be really prepared.